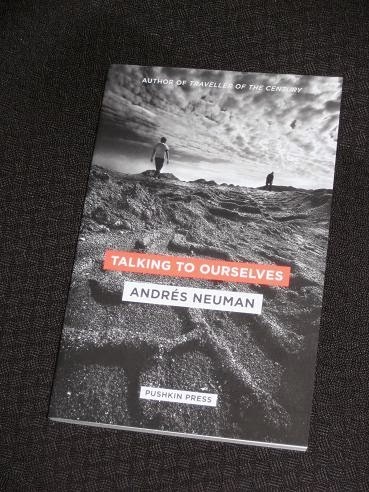 After the huge success of Traveller of the Century, many readers have been waiting anxiously for Andrés Neuman’s next work to appear in English – and I certainly count myself among that number. Perversely though, with such a huge weight of expectation (and having met the writer last year in Melbourne), I’ve found this is a review which isn’t that easy to write. Talking to Ourselves (translated by Nick Caistor and Lorenza Garcia, review copy courtesy of Pushkin Press) is a short novel in three voices, which together reveal the story of how a family deals with terminal illness. Mario, suffering from an unnamed disease, uses a short grace period of relatively good health to take his ten-year-old son, Lito, on a trip in his truck, his attempt to give his son one last, happy memory of their time together. Meanwhile, back at home, Mario’s wife Elena, physically and mentally exhausted from caring for her husband, sits around and worries – until she finds a way to cope. Talking to Ourselves is an excellent exploration of what it means to live with the knowledge of imminent death, and the way in which we avoid discussing the thoughts constantly circling around in our minds. By splitting his story into three alternating sections, each told in the first person by one of the family members, Neuman allows each of the main characters a say, all three having their own clear, unique voice (a credit to both the writer and the translators). While conversations are described in each of the sections, Mario, Elena and Lito are talking very much to themselves – occasionally at cross purposes. Lito’s part is, for obvious reasons, the slightest. Unaware of his father’s illness, he’s simply thrilled to be going on a journey he’s been looking forward to for a long time, a trip he’s likely to remember for the rest of his life. The writer paints a picture of a boy whose thinking hasn’t quite reached the level necessary to cope with his father’s illness – he still thinks he can control the weather with his moods and that life is like a rally game (a crash just means you lose time…). Elena is obviously drained by caring for her husband, and Neuman examines her emotional instability by allowing the reader to follow her through her relationship with the doctor. Of course, she is no better than her husband in this regard – her thoughts, elegantly set down in her diary, are, just like Mario’s words, meant purely for herself. The reason, which I suspected on the first reading but confirmed after rereading, is all to do with subjectivity (i.e. my preferences as a reader). You see, as mentioned above, the key to the book is Elena and the way in which her experiences as a carer have ground her down, leaving her open for the relationship she enters into with the good doctor. However, the moment she sleeps with him, she loses my good will, and this prevents me from enjoying the novel completely. Why does this affect my enjoyment so much? Well, it’s just the way I am. Anna Karenina and Madame Bovary, to name just two examples, are other books where I feel that the writer is expecting me to sympathise with a woman who betrays her husband, and while in each case I can see what drove her to infidelity, I can never quite bring myself to sympathise or empathise with her actions. Most readers will be able to enjoy Elena’s thoughts despite this, but for me her actions cast a very long shadow over her words. I also thought it would be interesting to imagine what would happen if the characters in the book were (to use an in-vogue expression) ‘gender-flipped’. Let’s imagine a story where a terminally-ill woman takes her daughter on one last trip, while the husband stays at home and throws himself into a sadomasochistic affair with his wife’s doctor. I really can’t see that one winning over many readers, but with the roles reversed there’s an expectation that the decision is more justified – or is this just me? Talking to myself & setting a hold with local library which has the book on order. MG – Good to hear (I'm sure you'll enjoy it!). I read 'Traveller of the Century' only recently and I feel its a very ambitious book in terms of ideas and obviously the length. I thought it as a fully realized novel. Initial reviews of 'Talking to Ourselves', meanwhile, hint that this one too is an ambitious effort albeit in terms of narrative structure and voice. I had been waiting for your opinion on this one, now I know! Have pre-ordered it, lets see!